Lucy Alice Designs is a family run studio based on the Kent coast. 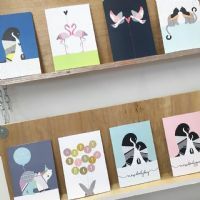 Using sustainably sourced materials, they create greetings cards, prints and jewellery, all inspired by a love of the Great British outdoors and the animals that surround us. Lucy founded Lucy Alice Designs in 2012 after completing a Textiles & Surface design degree. She was determined to make a living doing what she loves and be able to spend more time at home with her young family.